LibGuides and LibApps Updates Coming Your Way! We have some great updates coming by the end of this week to LibGuides, LibApps, and LibAuth to go with the official changing of the seasons. Happy fall to our fellow Northern Hemisphere denizens, and Happy Spring to our customers on the other side of the world! To kick us off, we’re pleased to announce that you can now Export All Rows for LibGuides Homepage and Guides statistical reports. So many have requested this that I’m sure there will be fireworks and bonfires in celebration. 🙂 To export your results, just run a report from Statistics > Homepage or Statistics > Guides, then click the Export All button. No more paging through results! Just download and slice and dice to your heart’s content. Ability to add Primo as a search source for LibGuides. 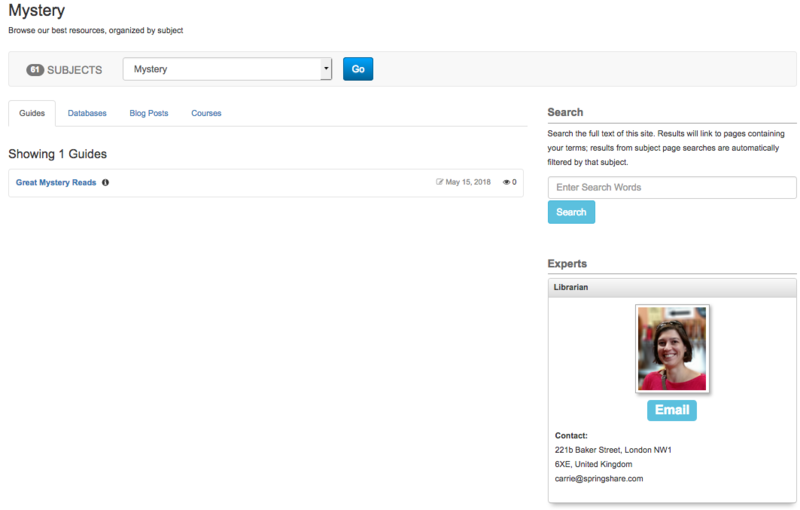 Now you can add search results from your Primo system as a tab or Bento box in your LibGuides system. This will be available from LibAnswers search in a future release. AZ Import > vendors are added and updated properly. AZ.php > the correct container class is applied when you use a custom footer. Accounts > Email options > Help ID has been corrected. Names now appear underneath profile boxes on the A-Z and Subject pages. XML exports sent to Summon now use the correct “last updated” date for guides. Accounts > Add > Contributor level is no longer grayed out. The Guides list filters properly when you have an apostrophe in a group name. We corrected an issue with password-protected reserves documents and the www version of a domain. 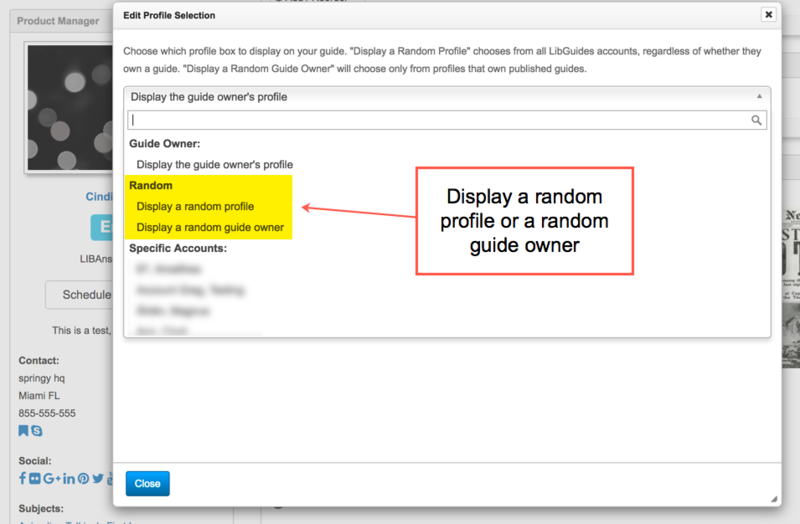 Discussion Boards: Regular level accounts can invite patron accounts from the guide edit page. Guide edit > add editor > we fixed the ability to create a new Editor account from here. Custom metadata has been added to guides rendered via widgets (and therefore to LTI). We have also done a ton of performance and optimization fixes all across the codebase, so you’ll see things like the Assets data table perform better. Also don’t miss this month’s Brunch ‘n’ Learn: “LibGuides Lab Work-In: Hands-On Help for Your Staff.” Check out this and other LibGuides training sessions live, or watch recorded videos. We have made a couple of improvements to LibApps as well. Now when you export all your LTI instances, the Content column just has the name of the matches content rather than the HTML link. We also made it so that if you request that we remove your custom SSL certificate so that you can start using Let’s Encrypt (free! ), there’s no gap in HTTPS coverage. 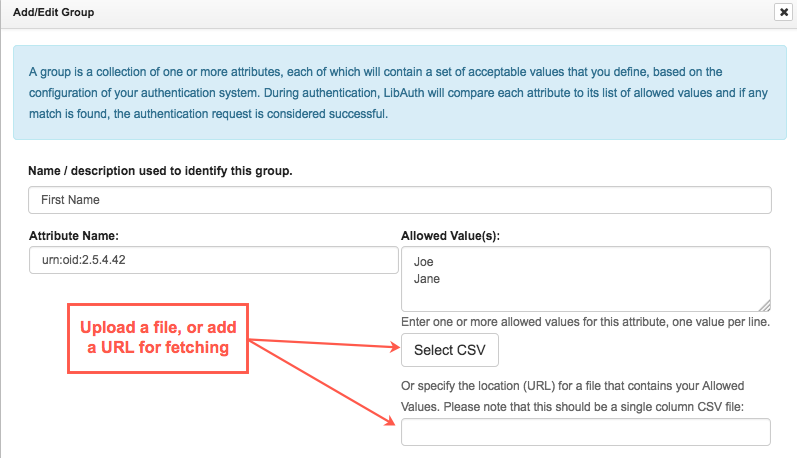 Over in LibAuth, we now support the Location attribute for SIP2 Connections, updated Federation metadata to use SHA256, and fixed an issue where the General pane of the LDAP configuration screen was not saved when you edited the login form tab. Summer is winding down here in the Northern Hemisphere, and we know lots of folks are getting ready for back-to-school. We’ve been getting ready, too! In addition to some back-end performance improvements for LibGuides, we area also pleased to tell you that we have a few features and fixes to report for our August release. This code release has already gone out to all regions, so all of the things below are ready and waiting. On the edit side, the addition of each post’s public URL near the title, for easy copying-and-pasting. A larger compose area when writing a blog post, as well as a rearrangement of some of the elements on the compose screen for better usability. Images within blog posts are now automatically constrained within the post’s container, and book covers have the same CSS selectors as they do when added to a regular guide page. We’ve been writing a lot lately about HTTPS and security. If you haven’t changed your LibGuides site to require all traffic to go over the secure HTTPS protocol, now’s a great time! We recently made a security change for blogs which also applies to Discussion Boards, if you’re a LibGuides CMS subscriber. All pages that accept user input (like blogs with comments, and like discussion board threads) are now required to be secure. To require your site to be secure, log into LibApps and go to Admin > Domains & Certificates > click the padlock icon for your site > Force HTTPS > click the Required button. Before you do, you’ll want to review your content and make sure that all your media/widgets, images, and other embedded content are changed to https, if it’s supported. This FAQ will tell you more about what to do. It’s now possible to take users directly to your SSO login form, if you would like the public side of your site to be protected by this additional security. 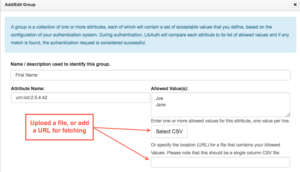 If you have set up a site-wide LibAuth rule to restrict the viewing of the public side of your site AND you also have one (and only one) LibAuth configuration set up, users will be taken directly to the SSO login page, rather than to the LibApps login page. Read more about restricting access to your site with LibAuth. Speaking of LibAuth, we have completely rewritten the back-end in order to make it faster, more extensible, and easier to add features to. Have a wishlist item for authenticating your users inside Springy products? Drop us a line! 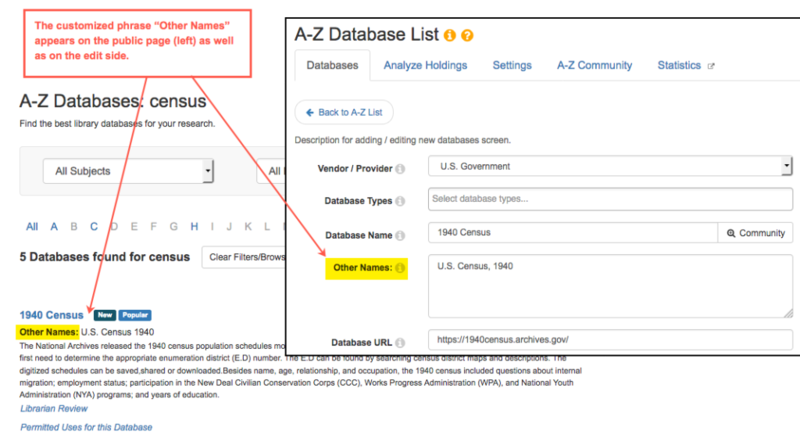 Accessibility: The A-Z list no longer contains duplicate IDs when databases appear in the main list and the sidebar. When an account is created, the name of the person who created the account is included in the Welcome email sent to the new account holder. You can now export all Database and non-Database assets using the Export All button, regardless of how many assets you have in your system. You can now export your LTI Instances using the Export All button–even if there are thousands of them! 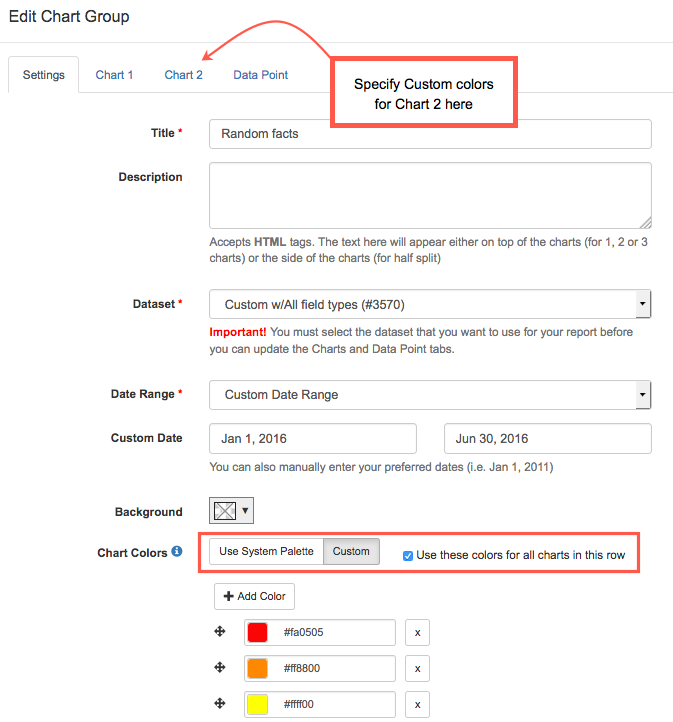 You can identify media/widget asset code more accurately when using the filters on Content > Assets. Protecting a site, guide, group, or any combination of those works correctly in LibAuth now, even when you’re using a guide as your custom system homepage. New LibAuth US Hardware Coming Your Way! Just a quick post to let you know that on Wednesday, July 18, at 11:00 a.m. Eastern time, we will be moving the US LibAuth server to new hardware. We’ve chosen this time because it seems to be the slowest time for all our US and Australian customers using this server. There will be up to 5 minutes of downtime while we make this change, which means that logging in via LibAuth for US customers may be unavailable during this time. No other application or function will be affected. The IP address of the server will NOT change, so if your use of LibAuth relies on letting a certain IP address through the firewall, you can rest assured; that will still work. As part of this week’s updates, we’re adding in new privacy control features and we’re extending these “GDPR tools” to all clients around the world, not just our clients in the European Union. Any library, anywhere, using Springshare tools can take advantage of these new features. We’ve added a new tab in Look & Feel that allows you to enable a small banner that shows on your public pages. The default language is short-and-sweet and also links to a longer Privacy Statement that details cookies and how we use information to collect statistics. This is a dismissible banner similar to ones you may have seen on other websites. 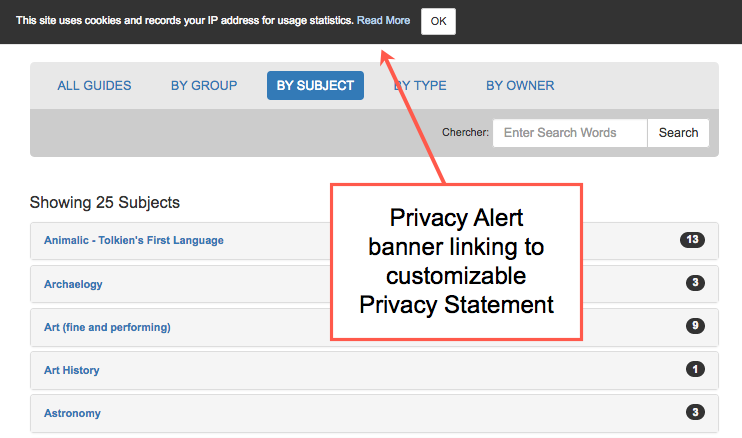 It’s off by default; turn it on by going to Admin > Look & Feel > User Privacy Alert. You’ll also see privacy information displayed on your Account settings page, and if you use Patron Accounts, your patrons will see this information on their Account settings page. Patrons will also see this information on the Self-Registration screen, if you have Self-Registration set up. Being GDPR-compliant also means providing a way for you to opt-in to the emails that you receive from us. Now when you go to your Account Settings page, you’ll be able to opt into the three types of emails that we send: our semi-regular Newsletter (full of tips and tricks as well as news! ); our Promotions emails; and word of upcoming webinars, online training, and SpringyCamp events. We hope you’ll opt in for all three! We’re commited to only sending you one email/month in each of those three email cateogries. You can change your options at any time by going to LibApps > My Account. New to Image Manager—Location Mappings! 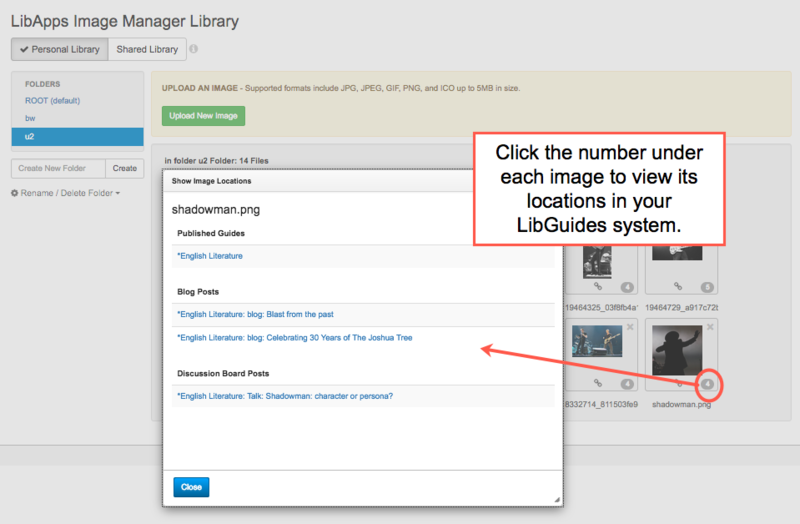 You’ll see the mappings when you open Image Manager from LibApps or when editing content in LibGuides. * Book covers generally are retrieved from Syndetics or Amazon and so are not included here. We will include the locations of images used inside your LibCal and LibAnswers sites, if applicable, in a future release. Dying to know who has subscribed to your system or guide blogs? Us too! Now you can view the list and, if necessary, unsubscribe email addresses. 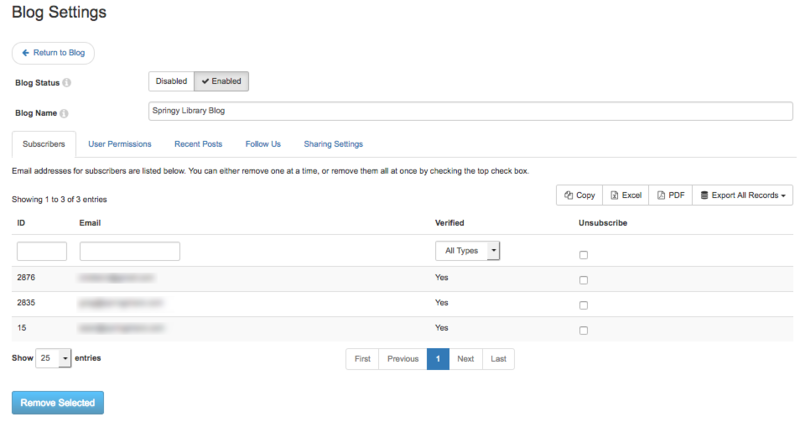 Just click Blog Management on any admin-side Blog page to view and manage your list. We made a change last year that saw blank ALT text added to Resource Icons. We heard from several of you who pointed out that while these are small, they tend to convey meaning, and sometimes even are linked, which means our move to declare these little beauties “decorative” was a move in the wrong direction. We’ve fixed that! The title of a Resource Icon is now used as its ALT text, and icons (and their links) are screen-reader and keyboard accessible. As a reminder, your mileage may vary depending on your browser, operating system, and screenreader. We test with widely-used accessibility checkers, browsers, and screenreaders, but accessibility is often a moving target. Did we miss something? Let us know! (link opens in a new tab). When only one expert is assigned to a subject, that person’s full profile box is shown. Profile boxes added as custom boxes to guide templates now show the person’s correct title. The A-Z databases page was changed so that it does not load Bootstrap when the admin has specified that Bootstrap should not be used across the site. We corrected a name spacing issue that was interfering with LibraryThing widgets. 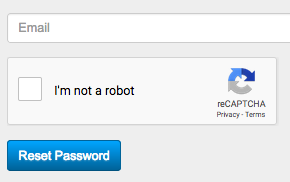 Since the Email Me button in a profile box is a mailto: link, we now validate email addresses entered there. You are now able to edit link assets when you have filtered the assets list by URL contents. We implemented the new Google logo for the Google Search content type, as well as added a missing ARIA label. We added the white background to the LibApps menu, when viewed on a mobile device. We corrected the processing of Gallery Boxes so that all slides do not show momentarily in Internet Explorer, and all Gallery Box content loads more speedily. Notification emails for blog posts now contain a full URL rather than a relative one, which was confusing some email programs. 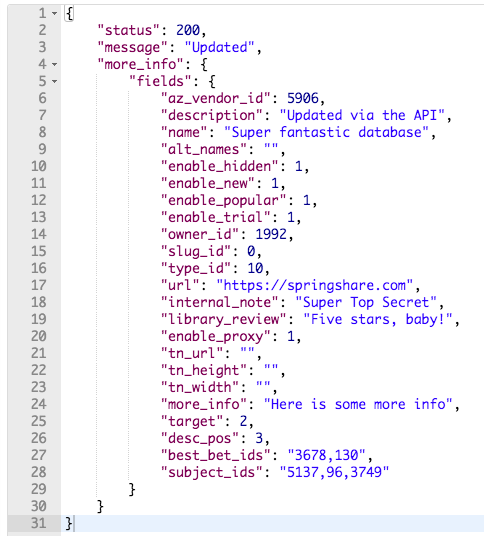 We inadvertently changed how A-Z database search results were presented. They’re now back to a single list, sorted by Relevance. Resource icons order has been restored to sort by the order in which they were added. In keeping with common practice, RSS feeds for blog pages now return the first 10 posts, rather than the entire blog feed. 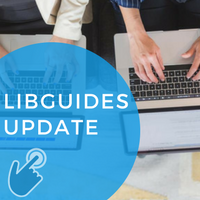 LibGuides Update: E-Reserves Item Search, Patron Login with LibAuth, LibAuth Setup Wizard, and a Ton More Updates! Check out this giant present for your holiday celebrations! There are a ton of new features for you to explore in LibGuides this month. Go to LibApps > Admin > Manage Patron Accounts to create accounts via import, or to LibApps > Admin > Manage Patron Accounts > Settings to enable self-registration. Set up your LibAuth configuration. 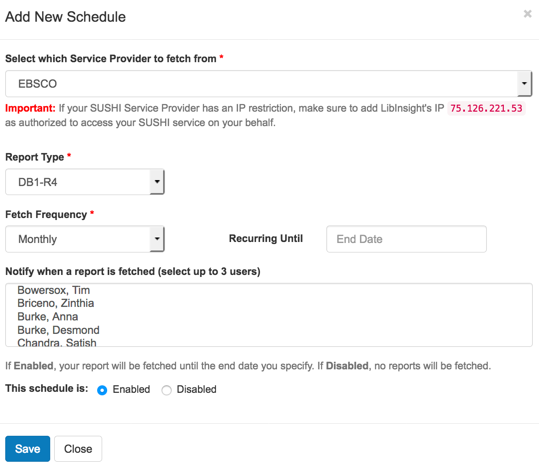 If your institution is a member of the InCommon Federation or UK Federation, you can now set up a LibAuth connection in just a few clicks. Just choose your institution name from the setup drop-down, and we’ll create a configuration for you, pasting in your metadata URL and filling in machine-readable attributes. If you’re not a member of either federation, or you wish to use a different protocol outside federation setup, no problem! Just choose to set up a configuration manually. We continue to support SAML / Shibboleth / ADFS, CAS, SIP2, LDAP, and a self-hosted script of your own creation. We are pleased to announce support for free Let’s Encrypt SSL certificates. Similar to the certificates that we manage for Springy domains (e.g., libguides.com), these short-term certificates for your LibGuides domains will be installed and renewed by us at no cost or bother to you. Simply change your site’s domain to your desired custom domain, and we’ll do the rest! Already have a custom domain? No problem! We’ll be requesting and installing Let’s Encrypt certificates for LibGuides custom domains in the coming weeks. If you prefer to upload your own SSL certificate, you can still do that, no problem! Sites that have already uploaded their own certificates will not be changed, although you are welcome to switch from your own certificate to Let’s Encrypt. Please contact support to get started: support@springshare.com. Let’s Encrypt certificates are currently only available for LibGuides sites with custom domains but will be coming to LibAnswers and LibCal custom domain sites in the near future. As always, we manage the SSL certificates for your LibWizard, LibStaffer, and LibInsight sites. Now you can provide a deeper search of your e-reserves content! Go into E-Reserves > Settings > Search and enable item search to see new tabbed search results on your E-Reserves pages that includes all E-Reserves items. 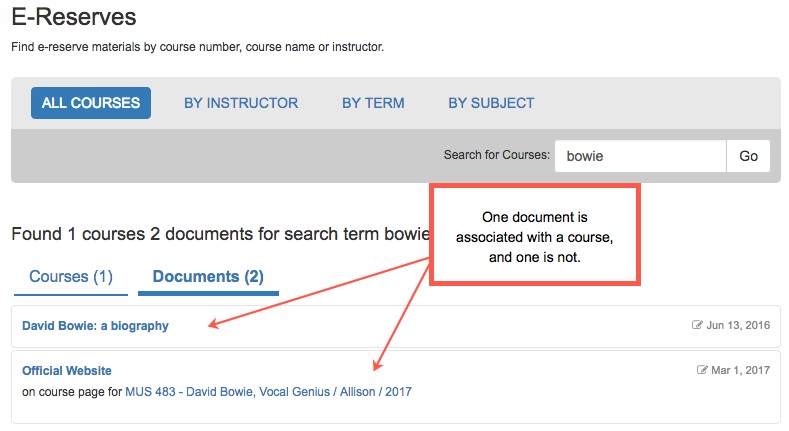 Search results include courses like they always have, but item search retrieves documents that are not assigned to a course as well as those that are. Visibility dates and access rules (passwords) for courses and items are also enforced. The new enhanced display also shows you which Subjects courses are assigned to. If you don’t want item level search, just head to E-Reserves > Settings > Search to disable the item level search. Want to send a link to your e-reserves courses by Instructor? By Subject? Now you can! Any URL that you navigate to on your public e-reserves pages is now savable and shareable. Bonus: this extends to search results, too! You can create a search retrieving exactly the desired subset of courses and documents and forward that on to the appropriate audience. Pssst, we heard you! 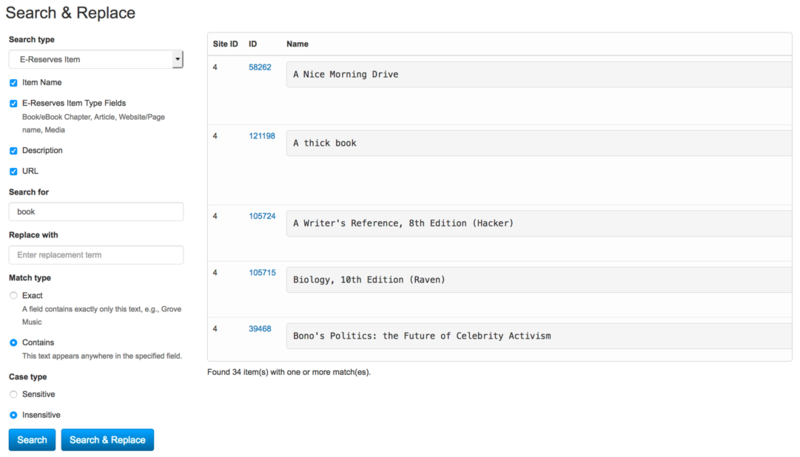 We’ll be making this change for the LibGuides system and group home pages in a release coming up in a few short weeks. 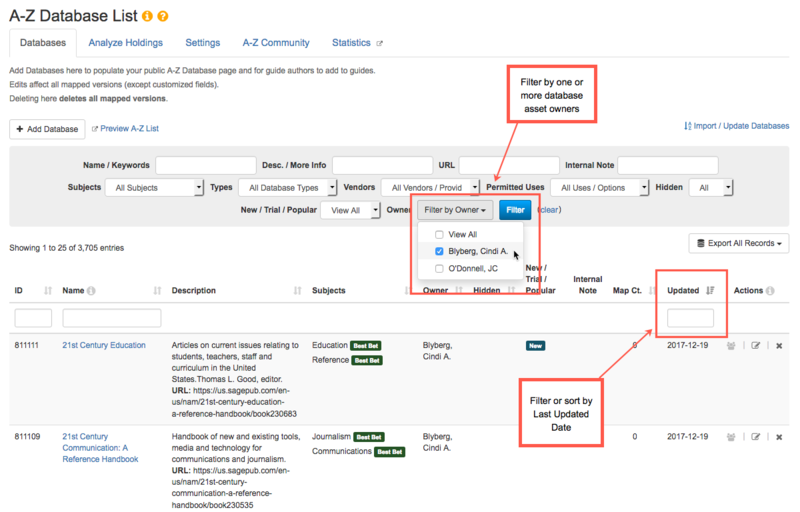 There are two new filters on the A-Z Databases management page: Asset Owner and Last Updated date. Use these to search for a subset of databases maintained by a certain person, or to make sure that updates have been done timely. …and Even More Small Fixes!